We have just came back from small road trip in Iceland. You can read more about it here: Iceland Part1 and Iceland Part2 . We wrote about the most exciting places for us which we visited. We shared few tips and advises which we wish we knew before we went to Iceland. Northern Lights were on our bucket list. Everybody that goes to Iceland want to see them. We were lucky to see them twice. Actually we had chance to see them one more time, but we didn’t, because of our tight schedule we decided to skip it. This post is only dedicated to Northern Lights in Iceland, information where to look for it and how to photograph it. On our first night we drove for 2 hours to get to the first hotel in Hella. We were heading toward Southern East part of the Iceland, about an hour away from Reykjavik. While we were driving, we have noticed some light colors on the sky. We weren’t sure if there were northern lights because we didn’t know what to look for. After some time, green color started to get brighter. We stopped in the closest driveway and started to enjoy views. It was beautiful dance of lights, but It didn’t last long, only about 10-15minutes. We were glad to see it. After getting to the hotel we drove back to the same area to find more lights, unfortunately without any success. This is where you save loads of money! There are many companies which offers northern light hunting tours. Basically what they do is the same, what we will explain you in this post. This tours are expensive for what it is – cost around 170 GBP per person. You can save that money for a trip which you cannot do on your own like Ice caving. Few local people advised us to skip this kind of tours and gave us some tips to find aurora. If you fancy the ride in superjeeps don’t forget that they are very common in Iceland and there are plenty of trips in them. Vedur.is – aurora forecast. This is the first step. Check if it is even worth trying to find northern lights. The map shows you where the sky is clear according to the time of the day. Basically you need to drive to white areas from the map and and look for clear sky. Another piece of information on this page is the intensity of lights in scale 0-9. In our case we took all our photos when the intensity was 6-7. We guarantee that you will get familiar with this website like everyone who goes to Iceland. Luckily, Iceland is not very populated country and It is easy to find the place away from the light, which is necessary to see aurora. If you are staying in Reykjavik, you can drive 15-30min to the north or east of the city depending on the forecast. You need a clear sky, a bit of luck and quick reaction (performance can last from 10 mins to 2 hours). When you feel that you drove far enough from the city and you just start to notice colour marks on the sky just turn into small road which leads to private houses. We found our spot and started our photo shoot. After about an hour one of tour buses stopped in the same place, what proved to us, it was worth saving money on norther lights trip. Photographing Northern lights is not as easy as it seems to be. I will try to explain it short and simple. First you will need a camera which lets you do long exposure. Most of the middle range cameras got that option, but you need to check this before going to shoot Aurora. There are many factors like sensor type, lens, aperture, shutter speed which determinate what settings to use. You need to use tripod stand to make camera stay still during exposure. If you don’t fancy carrying big stand, you can buy one of the pocket stands like this Joby Micro Tripod. They do great Job! Turn Manual focus! Some cameras won’t take a photo in dark, because they can’t to find a focus point. Set the biggest aperture of your lens (smallest F-number). That makes your camera the most sensitive to the light. It is necessary in shooting northern lights. Choose your ISO. This parameter makes photos lighter, but if you set it to high the photo will end up grainy. On my Lumix G7 I use the range between 1600-6400, what is very high, but I will explain it in the second. Shutter speed. It set the time of the exposure. The longer it is the brighter Image (anything moving in long exposure will be blurred). I have used shutter speed of 4sec-20sec. Now, all this setting depend on each other. aperture-ISO-shutter speed. You need to find a balance in this case mainly between ISO and shutter speed. We wanted to take some photos of us with the lights. It means that if we appear on the photo, we cannot move until exposure is finished. This make sense to use short exposure and higher ISO. If you want to photograph Northern lights on its own, lower ISO and extend shutter speed for the best results. We are so glad to see Northern Lights. It is an amazing night’s performance. The quick movement of beautiful unexpected colors on the sky, leaves you speechless and reminds you how beautiful the nature is. 170GBP for a northern lights tour? Perhaps for a private one, so don’t say every tour is so expensive.. lots of big tours are available for approx. 40-50gbp.. and icelandpremiumtours.is offers private tours for approx. 70gbp (9000isk)..
and “just look for a private road and park on it” is also pretty daft advice as Icelanders don’t expect cars/people on their property. Also Vedur.is is not good in predicting.. they so often are so wrong in their predictions. Sure you can try on your own, but as safety and success is on your list as well.. go with the/an experts! On our blog we are talking about budget way of traveling. We want to encourage group of travelers, who wouldn’t consider going to Iceland because of the money, to go and visit this place. 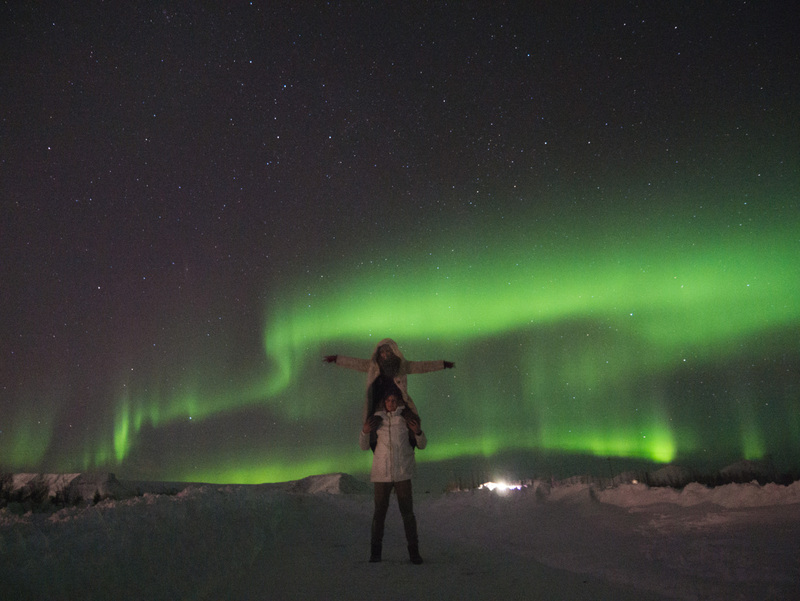 Group of friends can hire a car together and still have a hope to see northern lights. Telling people that they want be able to see Northern Lights without paying wouldn’t be right. But there are many tourists in Iceland, who are not concerned with money as much as younger travelers. They will go for a organised tour because it is more convenient for them, and these companies have more experience in hunting for northern lights. Hi Albert! Thanks for your comment, it is great to see that this little tutorial helps. Your Fuji X-T2 is a great camera, and you can get great results with that. If you are planning to catch northern lights you should follow the tutorial above, and try to adjust adjust shutter speed and apperature depending on previous photo. Simply saying, the smaller aperture the image gets darker. Same with exposure, the faster shutter speed, than camera has less time to get light, resulting in darker photo. If you got any more questions feel free to email me through contact form on our blog. Fantastic photos! Thanks for describing the camera settings, too. Thank you. I am glad it helped you!